Please note: This is not to be considered medical advice. I am merely passing on information that I have accumulated over the years. Everyone is unique and has their own personal experience. For any questions or concerns, I recommend consulting your health care provider. In my previous post, I described all the various food exchanges for each food group. 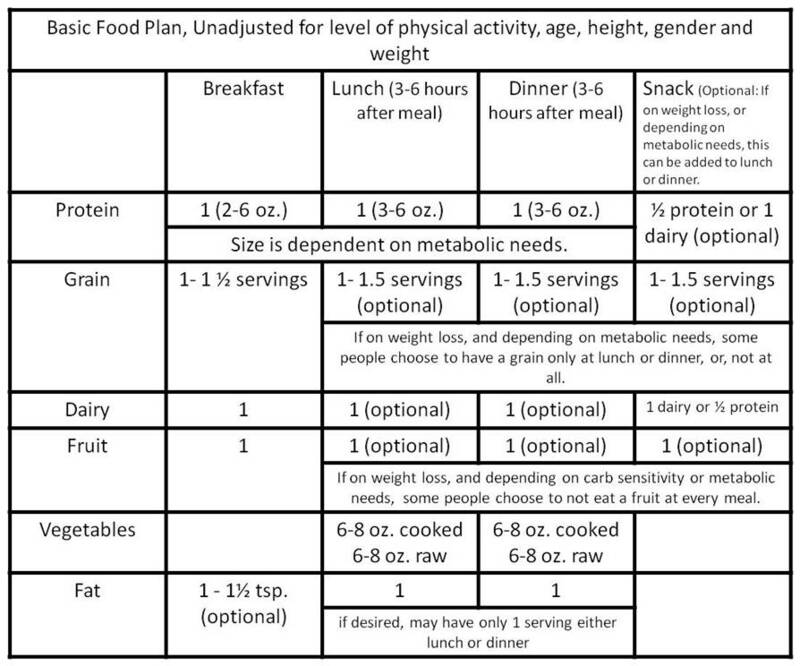 Now, I am going to try and describe how to take that information, and turn it into an individualized food plan. Please keep in mind, however, that “one size does not fit all.” A food plan depends on each person’s unique circumstances. Depending on age, body size, activity level and metabolism, a person might need more food to sustain their energy level and to avoid physical hunger. Another person, given their unique circumstances, might need less food. There also needs to be some flexibility. For some people, on days when they are more physically active, they might need to adjust their food intake accordingly. There are so many options! It is a live-and-learn process. From this, it becomes possible to make your own personal food plan. Breakfast: 2 oz. nuts, 1/4 cup uncooked cereal, 6 oz. yogurt and 1 medium fruit. Lunch: 3/4 cup cooked beans, 1 cup salad, 1 cup cooked vegetables and 1 tablespoon oil. Dinner: 4 oz. chicken, 1/2 cup cooked rice, 1 cup salad, 1 cup cooked vegetables and 1 tablespoon oil. There is an art and a science to determine the correct amount of food one requires. This is a flexible and fluid process. It depends on so many factors! I have known people to eat 2 cups of salad for lunch and dinner as well. So, I recommend having a reasonable amount of food and then monitoring your weight on a weekly, bi-weekly or monthly basis. Based on your progress, you can add or deduct food to your daily regime according to your results. Writing about healthy eating for the time challenged has proven to be a daunting task! I have a few more subtopics connected to this subject, but writing about recipes and cooking is really much more fun! References: The list is endless! I just hope that I didn’t forget anything! Thank you! I felt like I was writing a research paper. There is so much confusing information to assimilate. Hello Carol .I have nominated you for Sisterhood Of The World Blogger Award. Thank you! I feel so honored! I appreciate your support! This is very informative and precise. I like how you broke down the plans and presented in such a way that it makes sense and finally even I could come up with a plan based upon what you’ve provided here. Thank you for sharing. You were my inspiration! I am so happy that you find it helpful! My pleasure! I hope it helps! (I had to resend this)I thought if it was laid out systematically, then it would be easier to visualize. This is something that I do for other people all the time. Now, I can just refer them to the blog! Thank you! I hope it helps! That is my goal! This is very doable and possible to achieve and maintain. And, it doesn’t need to take over your whole life either. I promise! It may not be as much fun to write about, but the information will greatly help many in need. You have greatly simplified and provided a realistic guide for healthy eating. Each person will have to customize it, but that is the reality of life. I would encourage your readers to create lists for each macronutrient category (protein, carb, fat) so they can choose each day from a variety of foods to avoid boredom. Thank you for taking the time and sharing this option for those in need. That’s a great idea! It is very important to eat a variety in all food groups. Another way to do that is to eat food in its season. Then, over a year, you would be eating a variety. Thank you for your suggestion! So much work for you to put this all together! thanks so much Carol! Very helpful! I hope so! If it helps others, then it’s worth it. yes and lots of us need it so it is very helpful! I am so happy! Thank you! 🙂 it is awesome to have a professional!